You may be feasting your eyes on initial pricing of the soon-to-be-announced DROID CHARGE and HTC Incredible 2 which we are expecting to land in Verizon stores some time in April. We’re a little shocked at the CHARGE $299 price, but will have to assume that it will drop to $249 or even $199 at stores through instant discounts because there is no way in you-know-what, that they’ll move any units if it comes in at that price. This phone has received zero love from our readers on every poll we’ve run with it as a choice, so hopefully they have a plan that includes immediate cuts from that “MAP’d” price. Seeing the Incredible 2 at $199 though, seems just about where we’d expect it to be. 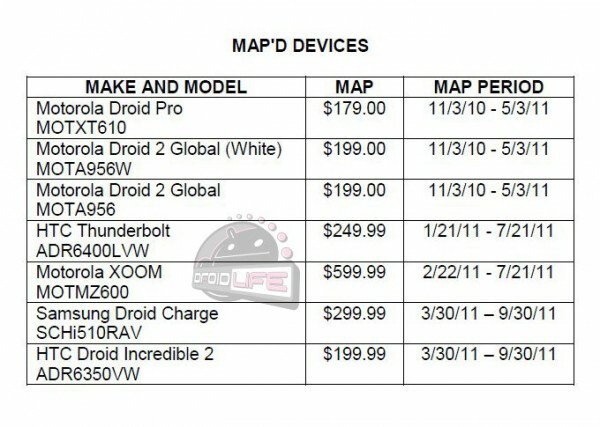 The previous version was at $199, so was the DROIDX, DROID2 and every other non-4G high-end Android device that’s come through Verizon. I hate to say this, but isn’t $199 almost looking inexpensive these days? I feel as if $249 for the Thunderbolt was just the beginning of a trend towards ridiculously expensive handsets.